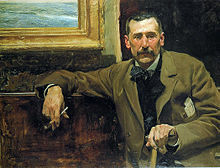 Benito Pérez Galdós (May 10, 1843 – January 4, 1920) was a Spanish realist novelist. Considered by many second only to Cervantes in stature, Pérez Galdós was the greatest Spanish realist novelist. Born in Las Palmas de Gran Canaria, Canary Islands, he moved to Madrid at the age of 20 where he spent most of his adult life. Within Spain his most popular works are the earlier works: the Episodios nacionales (46 volumes). Outside Spain his Novelas españolas contemporáneas are more popular. Wikimedia Commons has media related to Benito Pérez Galdós.